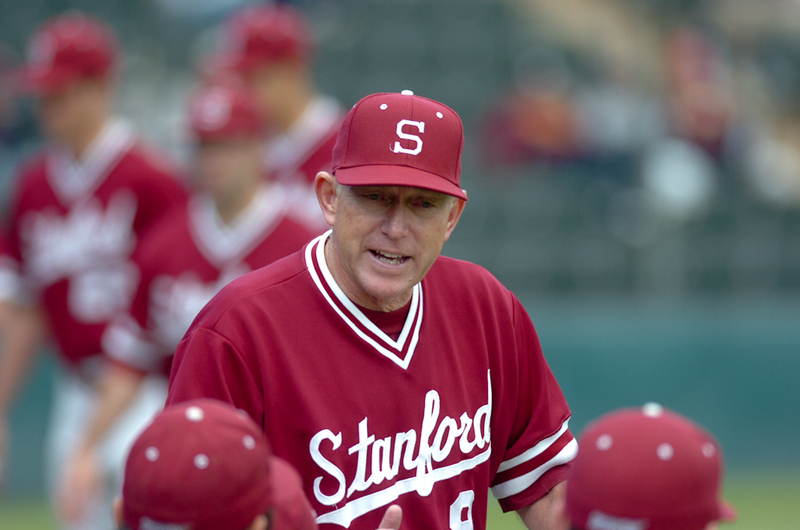 With the 2012 NCAA baseball tournament opening up on Friday, it’s the season to remember when, 25 years ago, the Stanford baseball team was the king of college baseball. In a back-and-forth affair, the Cardinal bested the Oklahoma State Cowboys 9-5 at Omaha’s Rosenblatt Stadium to capture its first College World Series title on June 7, 1987. Buoyed by All-American starter Jack McDowell, who pitched seven innings on only two days rest in his third start in the double-elimination world series, the Cardinal rallied from a 3-2 deficit in the fifth inning to pull ahead 6-4, then tacked on three insurance runs in the ninth before the final out. A bouncing ball went straight back to closer Steve Chitren, who tossed it to first base to secure the title. The Cardinal also benefited from shortstop David Esquer, who turned four double plays for the second consecutive game, and once again from freshman rightfielder Paul Carey, who continued his impressive hitting in Omaha by going 3-for-5 with two RBI and scoring two runs of his own en route to being named the MVP of the College World Series. In its run to the title, Stanford beat Georgia 3-2, beat Texas 6-1 and lost to Oklahoma State, 6-2, forcing it into an elimination game with Louisiana State. That’s where Carey, even before the final game against the Cowboys, had made himself the MVP of the series. Down 5-2 in the 10th inning to the Tigers, Carey, who was 2-for-13 so far in the series, smashed an opposite-field grand slam over the left-field fence to give the Cardinal a 6-5 win and eliminate LSU. “After that one, I kind of knew, to be honest with you, I mean, to come back and win it like that, maybe it is our year, and it proved to be our year,” Stanford head coach Mark Marquess told ESPN after the title win. With all the momentum in its favor, the Cardinal bested Texas once again, 9-3, to reach the final game against the Cowboys. Stanford had never finished higher than third in five previous trips to Omaha, and had lost three straight to OSU over the last two seasons, including the 6-2 loss the week before, leading to some extra motivation for the Cardinal well before the College World Series. “At the beginning of the season in January, the team got together at my house for my 21st birthday party, and we made a toast to a national championship over Oklahoma State. I’m not making this up,” McDowell told The Daily. Carey, in his post-title game interview with ESPN, said the team knew that it was finally its year after the LSU victory. “Yeah we felt destined, this is just an unbelievable feeling, we knew we could do it, we had to do it against Texas when we played them tonight, we knew we could do it, we just had to go out and swing the bats the way we could,” a breathless Carey responded. “I don’t know if you know it, but you are the most valuable player in this tournament,” the reporter responded. The next year, the Cardinal would repeat as College World Series champions, taking a less dramatic route to the national title, winning every game in Omaha, including a 9-4 win over Arizona State in the championship game. Perhaps the most impressive thing about the repeat title run was that the Cardinal was without three of its stars from 1987 — McDowell, Amaro and Esquer. McDowell, who was picked fifth overall in the draft by the White Sox in 1987, played in the majors for 12 years and recorded a career record of 127-87. The Van Nuys, Calif., native went on to make three All-Star teams, and captured the 1993 American League Cy Young Award when he led the White Sox to the ALCS against the eventual world champion Toronto Blue Jays. Interestingly, series opponents McDowell and Oklahoma State’s Robin Ventura, who had an NCAA Division I record 58-game hit streak in 1987, played together on the Chicago White Sox from 1989 to 1994. Amaro, who led the Cardinal in runs, triples and stolen bases as a senior, went on to an eight-year MLB career with the Angels, Indians and Phillies. After his playing career ended, Amaro joined the Phillies as the assistant general manager in 1998, and was promoted to general manager in 2008, where he remains one of the most influential executives in the MLB. Esquer, who played three seasons in the minors, became an assistant coach at Stanford in 1991, then became head coach of the Cal Bears in 2000. In his 12 years at Berkeley, Esquer has been named Pac-10 Coach of the Year in 2001 and NCAA Coach of the Year in 2011, when he took the Bears to the College World Series. Meanwhile, Carey, the 1987 World Series hero, never found any footing in the majors, playing only 18 games with the Baltimore Orioles in 1993. Today, it’s been 24 years since the Cardinal held the College World Series trophy aloft in Omaha, despite making it to the title game in 2000, 2001 and 2003. But perhaps the 2012 Cardinal team, hosting a regional for the first time since 2008, can return to Omaha and finally return the title to the Farm after more than two decades away.